Has anyone done this? I can't remember and haven't found any pics. 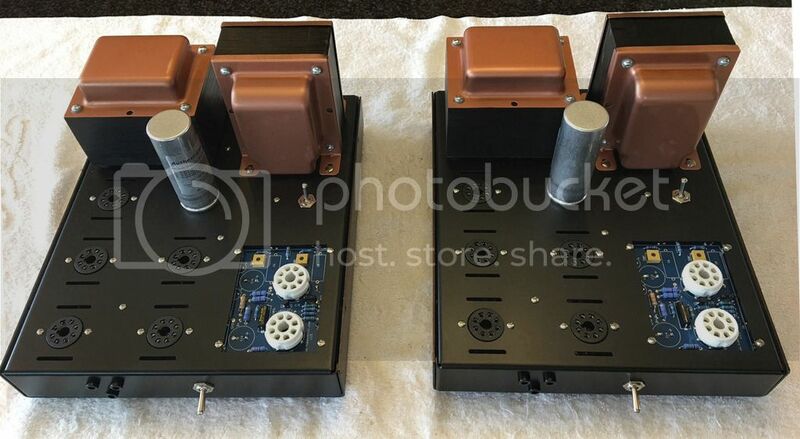 Above > Custom painted VTA M-125 monoblock amps with the octal driver circuit ..
You can the octal driver circuit for the VTA M-125's but IMHO the octal driver board has no "sound quality advantage" over the standard noval driver board. The octal driver board also has disadvantages. A 6SN7 tube will draw double the current of a 12AU7 driver tube. Any amp with an octal driver will run noticeably warmer than a board with a noval tube driver and add some stress to the power transformer. Large USA manufacturers of tube amps like McIntosh and Conrad Johnson have never used octal driver tubes. About 2009 McIntosh came out with their new statement tube amp - the 300 watt MC2301 monoblock amps. These amps are $22,000 a pair. At that price they could have chosen any driver circuit/driver tube for best sound. Each MC2301 amp uses two 12AT7 (noval - 9 pin) driver tubes. Ok, now I remember reading this response to a previous post. I get all of that. I just think the 6SN7's would look cool with the big tubes. Would they really stress the PT that much? corndog71 wrote: I just think the 6SN7's would look cool with the big tubes. This is the thing that causes some audiophiles to really like 6SN7's. Yes - they are larger tubes than noval tubes and look more "impressive" but don't really (IMHO) sound any better. I have also found that 6SN7's tend to be more microphonic than noval driver tubes. As an side > I have had people tell me that they chose KT88's over 6550 output tubes because "they liked the shape of the KT88 better than the 6550" when in reality there isn't much of a difference in sound quality between the two tubes. Heh, yeah, I actually like the reissue Tung Sol 6550's and they're reasonably priced. Well, it was just a thought regarding the 6SN7s. There are lots more of the noval tubes to choose from. Don't know about you, but I'm not getting any younger. If you can afford it, go for it and be happy! I have had both noval and octal M-125 drivers. The 12BH7As (NOS) Bob include(s)(d) with his amp are excellent. However, I have had superb experiences with the octal drivers as well, esp. with the top-drawer Chinese CV-181s (ShuGuang and PSVanes). Having traveled to China (and specifically to Changsha where the tube factories are) numerous times I can attest they are weird to deal with; personalities are everything, and unlike New Sensor have no credible dealers in the U.S. The Chinese tubes, although bigger than US 6SN7s, don't seem to draw as much heater current . unfortunately, the octal VS noval tube thing is one issue where Bob and I totally disagree. 90% of my customers who have upgraded their amps with the octal board say it sounds better. Thousands of audiophiles will tell you the 6SN7 is one of the best sounding audio tubes ever made. Bob is right that they draw twice as much filament current. such as the one Bob supplies with new ST70 & ST120 amp kits. The only noval audiophile tube that is close to a 6SN7 in sound quality is the 6FQ7. That is the tube used in the SP13 preamp. The 6SN7 is used in the SP14 preamp. Dave (deepee) has both an SP13 and SP14 preamp and can probably chip in here, but I'll admit between the two it's a dead match win between either one. Don Sachs probably won't chip in here, but he calls the SP14 with 6SN7 tubes, THE FINEST PREAMP I HAVE EVER HEARD !!. Don has restored dozens of HK Citation 1 preamps, as well as top of the line Mac, Scott, and Fisher preamps. He also says "The 6SN7 is a fantastic audio tube as noted above. If you are used to the sound of small tubes you are in for a treat, and you most likely will never go back." Now in an ST70 or ST120, I will recommend the 12BH7 (which BTW, also draws twice the filament current of a 12AU7). I must agree with Roy (tubes4hifi) here. Been using just the center driver (ST-120) with the adaptor and a 6SN7 for over a year and not only is the sound "nicer" but there have been zero indications that there is any stress on the PS. There are a wide variety of new and old-stock 6SN7s available and yes, some are microphonic. I've actually had more microphonics in the 12AU7s I've tried. Maybe sheer dumb luck. But I see no reason to forsake the possibilities. Side drivers on the ST-120, rear driver in the M-125 - no conceivable reason to make the switch. It's a Rolls Royce/Bentley kinda thing. I lean toward the octal drivers and preamps in the VTA/Tubes4hifi catalogue, having owned both iterations of M-125s and the SP-13 and -14. Can't say for sure why I like the octals better, and maybe it is simply a matter of aesthetics. The 6SN7/CV-181 is a ballsy tube, but so are good NOS 12BH7s and 6CG7s despite their diminutive nature. Of far greater importance are the tubes themselves, not their size, and the less visible quality of construction and the parts under the hood such as caps, resistors and wiring, and in the case of pre-amps, the front-panel controls. I wouldn't kick either version out of bed for eating crackers, that's for sure. After a long and expensive learning curve, were I starting from scratch I'd plunk $3k down on Don Sachs' iteration of the SP-14, stuff it with top-notch Shu Guang CV-181s, and never look back. I had Don do some similar tweaks to my SP-13 with the same stunning results. In both cases he uses Roy's boards and basic designs but with significantly better (and more expensive) components where the sound really matters. Whatever the choice, it's a win-win all the way around. You can start with the absolute basics at the cheapest price and the results will still make your socks roll up and down. Get used to that sound for a year or two, then when fortunes permit, you'll really appreciate what a few tweaks and upgrades can do. Ditto on Roy & Kently's comments I'm using a 6SN7 in the center position in my ST-120 PURE BLISS!!! I decided to try a 6SN7 with adapter for my ST120. I originally got a new Tung Sol 6SN7 that had a terrible hum. Returned it and got another that was also unusable. I then got a Treasure CV181 from China that arrived in many small pieces. Got a refund for that. I finally got some very nice Sylvania 6SN7GTB tubes with balanced triodes from 1959. I liked the 6SN7 in the center position and decided to get and build an octal driver board from Roy. So now, all three drivers are matched 6SN7GTB's. The amp sounds great and the octals are not microphonic at all and really more quiet than almost all the noval drivers I used with the original board. I had even gotten a Platinum-grade Indian-manufactured Mullard CV4003 from Upscale Audio that cost twice what I got a matched quad of 6SN7's for that was terribly microphonic. So, my experience with octal drivers in the ST120 has been very positive. eickmewg wrote: I decided to try a 6SN7 with adapter for my ST120. I originally got a new Tung Sol 6SN7 that had a terrible hum. Returned it and got another that was also unusable. I then got a Treasure CV181 from China that arrived in many small pieces. Got a refund for that. I finally got some very nice Sylvania 6SN7GTB tubes with balanced triodes from 1959. I liked the 6SN7 in the center position and decided to get and build an octal driver board from Roy. So now, all three drivers are matched 6SN7GTB's. The amp sounds great and the octals are not microphonic at all and really more quiet than almost all the noval drivers I used with the original board. I had even gotten a Platinum-grade Indian-manufactured Mullard CV4003 from Upscale Audio that cost twice what I got a matched quad of 6SN7's for that was terribly microphonic. So, my experience with octal drivers in the ST120 has been very positive. Get your new re-issue toobs from Jim McShane in Chicago. Get your NOS from Andy Bowman or a guy in Turkey and a couple of hams I personally can vouch for but don't want to stick their heads up. This would be a PM issue. You want Chinese toobs? There are a couple of honourable re-sellers on fleabay or just fly to Changsha, about 3 hours south of Beijing, to the one and only toob factory in the country. I like the Chinese tubes. They make mil-spec bottles that will rival any original US or European WW II issues in Changsha, and sell the rejects into the high-end audio market and are pieces of shite. Again, you've got to know your counterparty. Again, PM for reliable sources if you want. I have no dog in this fight. Between Bob L and Roy M. you've already got the battleship. What glass guns you choose to locate upon same will bring out the other 50 per cent of their shipyard designs. Can someone please give me a reliable source for a the 12AU7 to 6SN7 tube adapter that i will need. I see on eBay what appears to be different adapters for different voltages and since I don't know which one I need I'm asking here for a source. Send me your address and I'll send you an adapter. Thank you Bill. Message with address has been sent. At least I think so...it shows to still be in the outbox even though I hit the send button. I got the address. On vacation at the beach so I'll send it out next Monday. Try to avoid getting sand in your amp..it's takes away from the tubular goodness. I have one more 12AU7 to 6SN7 adapter. First to claim it gets it. Be sure to give me an address. Also, if you need a 6SN7 tube, I have quite a few spares and can include one to try out the octal setup. Just pass along the karma. And we have a winner! Corndog71 will get to try the adapter and 6SN7 tube and will post his impressions. I'm all out of adapters now; they both seem to have gone to the "dogs." From the info I gathered from this thread, I pulled the RCA 5963s from the rear part of the driver board of the M125s and replaced with GE 12BH7As from a sleeve of 5 purchased last year that I never used. They still sound incredible, have not heard enough to tell a difference. Didn't realize they are a little taller too. Will be interesting to see what dog has to say about a 6SN7 instead in that spot. So on the M125 the front 12AU7A is an inverter and does not have to match the rear? It's impressive to me that the two "top dogs" of the VTA world hold opposing views here. Subjective tastes, long may they reign! I have the 12au's/BH7 in my VTA ST 70 and the octals in my Mk IIIs. I also have the octal SP14. I love the big, ultra-clean yet juicy sound of the SP14 with the Mk IIIs. The ST 70 also sounds great.